General Lord Edward Somerset was an important man. One of Wellington’s favourite Generals, he even managed to combine his military career with one as an MP. Those talents, maybe aided by his family heritage, earned him a monument which you can visit near the family home at Badminton, high on the Cotswold Edge at Hawkesbury Upton. The highest part of our day’s ride. You’re bound to suffer a little discomfort when the lowest and high points of your ride are within two miles of each other, your lungs will heave and your legs burn. That’s what happened on the way to see General Somerset’s monument. The descent from Alderley was steep, rain and wet leaves making the road slippery, though it let me build a good turn of speed for the short but steep dig to Hillesley. I got there first and waited in torrential rain, getting cold and wetter than I already was. 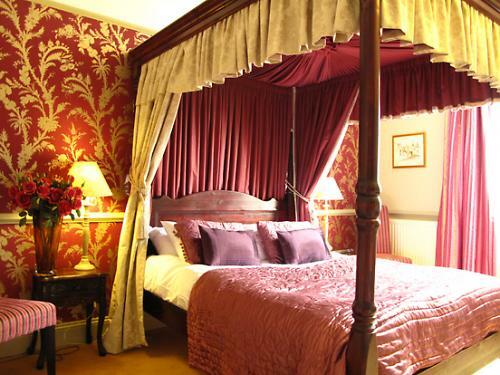 We’d spent the previous night at The Ormond Hotel, in the Cotswold town of Tetbury. Unable to find anywhere in the UK providing what he wanted, hotel owner Iain Bailey created Cotswold Cycling Breaks, based at the hotel, with the ambition of catering to the cyclist’s every need. One of the things they provide is a good selection of routes of varying difficulty and, the day before we’d been guided round one of the easy ones, a 20-odd mile meander through beautiful, if damp autumn countryside, skirting the grounds of Prince Charles’ Highgrove House. The day was slipping away by the time we arrived back at the hotel, and earlier rain ensured our bikes were crusted with grime, though all we had to do was hand them over for cleaning before being stored securely overnight. The route taking in the General’s monument was longer, about 40 miles and graded Intermediate. We’d started with bright sunlight shining off soaked and deserted roads, though it wasn’t long before dark clouds had rolled over us, bringing heavy rain, precipitating a stop to don waterproofs. It wasn’t warm either, so despite not having travelled far, the ride was already becoming epic. 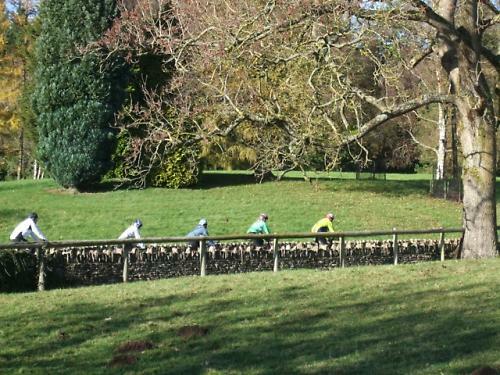 The rest of my group joined me in Hillesley and we set off up the main part of the climb. To get some heat back in my legs, I asked if the others minded me riding hard up the hill, there’s never a bad time to get some training in, after all. I sprinted off, though one of the group had followed and was sitting on my wheel. The slope ramps up quite steeply and the surface is poor, especially under the trees. I shifted to the little ring and kept the pressure on the pedals, though my effort under control. Just as the road levelled and dropped for a few precious metres, a combination of rain, cold and the sweat of exertion conspired to mist my glasses. Now there was just the final run to the top. Not only do Cotswold Cycling Breaks clean your bike and arrange routes for you to select, they load them onto a Garmin Edge 800 for you. One Garmin is provided per group, so provided you stay together, you should never get lost. If you are unable to repair a mechanical, a local bike shop is pre-warned and will come and recover you, for a fee. Before you ride they’ll hand out gels and energy bars to keep you going and the menu has even had a little help from a sports nutritionist, who probably wouldn’t recommend the real ales and wine from the busy bar. We stopped in the unspoilt, picturesque village of Castle Combe with the rain still pouring down, but, by the time I’d struggled to get my sodden gloves back on and powered back up the hill in the big ring (where was that form during the race season,) it was dry and the sun was trying hard to prise the clouds apart. As we briefly rode parallel to the M4, finally there was some brightness in the day and the remaining miles were ridden under blue skies, the reds and golds of the remaining leaves all the more striking, beautiful honey stoned cottages flaunted themselves in golden autumn light. Out of the saddle breathing hard, rain tapping on my helmet, sweat and rain dripping from my nose and that familiar burn returning to my legs, I pushed as hard as I could up the final 14% slope. I even managed to open a slight gap on my companion, who arrived and leant his bike against the stone wall just after me. After all that effort, the top of the General’s monument was invisible, so low and thick was the cloud. Before encouraging the rest of the group up the last few metres of the climb, I peered through the gloom, and was nearly able to make out what, on another day, would have been a fantastic view towards the Bristol Channel and beyond. 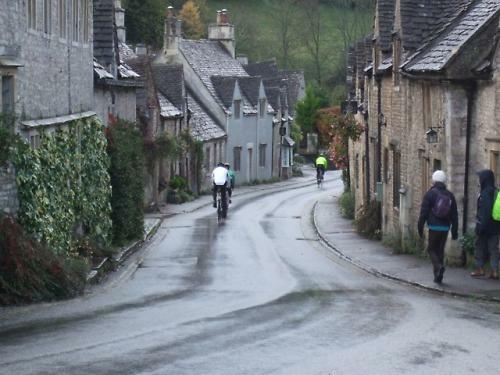 The Cotswolds is a great place to ride a bike, undulating and varied terrain providing ride options for all ambitions and abilities. The countryside and villages are beautiful, and there are no end of pubs and cafés where you can rest your weary legs after riding its generally quiet roads. 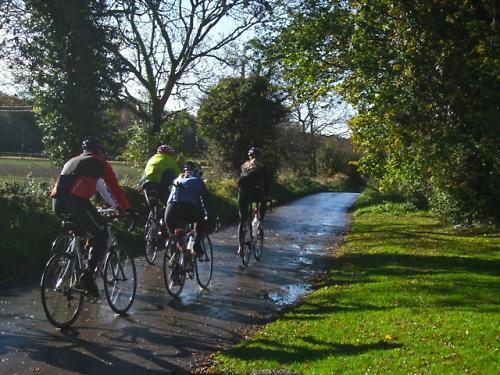 So, if you fancy a riding weekend with no hassle, Cotswold Cycling Breaks could well be the answer. Great article. I cycled from my home in Bath to a friend's house near Cheltenham last summer and it was one of the best rides I've ever done. Once you get up onto the Cotswolds it kind of plateaus, with amazing views across the Severn into Wales. I camped at Thistledown Farm, (http://thistledown.org.uk) which is eco-friendly, offers a discount for cyclists and - most importantly - is a stone's throw away from a really nice pub. +1 Tetbury and the surrounding area is a lovely part of the world to cycle - no end of traffic-free lanes and a good mix of scenic flat routes and lumpier, more challenging ones. There's also a fair few good pubs and local ales to aid post-ride "recovery"
I admit to bias as the Ormond is my local and the group in this article were from the local Ormond Velos cycle club: my club too. That said, the cycling in this part of the Cotswolds is beautiful and can be epicly tough or a gentle spin, depending on your pleasure. The Ormond itself is a great base so if your looking for some UK based cycle tourism give it a go.